Neurowise™is MangaDesign’s communication methodology that enables the optimization of your brand communications to the way the brain works, facilitating decision-making and improving business results. We’ve developed Neurowise™ to help our clients, smartly cut through the communication clutter, by increasing the effectiveness—not the volume—of their marketing messages. At its core, Neurowise™ is applied neuromarketing. Its framework is built on neuromarketing’s functional operating principles, strengthened with actionable concepts from consumer psychology, learning theory and visual communication. The most important finding of neuromarketing—and indeed its entire premise—is that more than 90% of purchasing decisions are made on a subconscious level. Other important findings show that most purchasing decisions are driven by a fear of pain or a desire for pleasure and that people react best to very “base” emotional appeals. A. Human brains process much of their sensory input subconsciously. B. The Reptilian Brain is the trigger of decision. C. People make decisions emotionally and justify them rationally with facts. 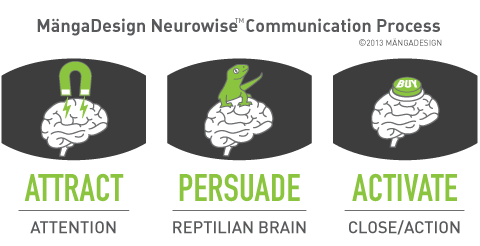 Simply put, Neurowise™ works by optimizing marketing messages to appeal to your customers’ brain, starting at its most instinctual part: the Reptilian Brain, which science has proven, is the brain’s true decision maker. 1. Attract Attention. Before we have interest, we need to attract attention. The magnet that attracts our attention is emotion. Recent discoveries have produced a major shift in neurologists’ understanding of how we pay attention. In The Advertised Mind, Erik du Plessis looks at the science of how learning occurs and affirms: …“it is emotion that governs all our behaviour, driving our unconscious reactions, but also determining what becomes conscious. Emotion feeds into, shapes and controls our conscious thought.” So our main task is to evoke emotion and create interest. Neuroscience tells us that pain avoidance is the main, unspoken reason why customers buy. Pains or threats activate the oldest, most primitive area of our brains. We create interest by revealing the true decision factors in your customers’ brains and by addressing your customers’ greatest pains. 2. Persuade the Reptilian. You need to start by targeting the Reptilian Brain as your message will travel up from there. Because the brain needs to conserve (thinking) energy it always seeks shortcuts and quick decisions. Simpler messages will resonate more with the most primal part of the brain. But how do you systematically reach the Reptilian—the real decision maker? Research shows the Reptilian responds to only six very specific stimuli: self-centred, contrast, tangible, beginning and end, visual and emotion. Mastering them gives you the key to unlocking the decision-making process. More about the six stimuli. 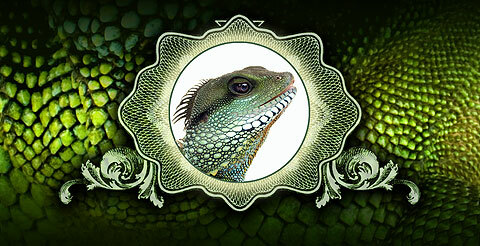 To persuade the Reptilian, we provide your customers with three compelling reasons to buy from you. These are your claims that express your value proposition in its simplest, yet most powerful form. Then we support your claims with strong proof of gain. It’s a sure way to trigger desire and intent leading to engagement. 3. Activate Action/Closing. The objective here is to move customers to the desired action, ultimately helping you close more deals—faster. 1. NeuroWebsites : A persuasive microsite to get you immediately neuromarketing, where you can use all your NeuroAssets right away. 3. NeuroExplanation: An effective visual tool to quickly and clearly present critical parts of your process, service or product through an easy to understand illustration. 4. NeuroPictures: Sum up your Claims with easy to grasp visuals that create strong emotional impact. 5. NeuroIcons: Create icons that optimize your Claims and iconify your value proposition to work with your brand, logo or visual style. These professionally designed NeuroAssets are optimized to engage the Reptilian Brain, while accelerating decision-making. Because they rely on visual stimuli, the images and information are more likely to be internalized, with the increased potential of affecting customers’ attitudes and behaviour. Although the Reptilian Brain controls the decision, all Three Brains (Reptilian, Middle Brain, and New Brain) are involved in the decision making/buying process and contribute their inputs. They have established numerous interconnections through which they influence one another, that’s why our Neurowise™ methodology appeals, engages and markets to all three brains. To augment the brain’s visual / emotional engagement, and render your message more persuasive, MängaDesign employs many techniques to create relevance and meaning such as: wrapping your message into a visual story that sells to all Three Brains, engaging the New Brain through the use of logic, or deploying the awesome power of deep metaphors. Metaphors connect meaningfully with your customers, shaping their worldview and behaviour. Because visual images are processed differently than verbal messages and are not subject to the same logical scrutiny and counterarguing (Biel 1993) hence they are a powerful tool for effective marketing. Why is Neurowise™ important to you? The brain is our most expensive organ to operate. It’s only 2% of the body’s weight, yet it consumes 20% of its energy. Because of that, the brain always seeks to conserve energy so “ease of processing” is very important. Complicated messages that require cognitive resources will likely be ignored by the brain. In our over-communicated world, it’s estimated that we receive as much as 10,000 messages per day. This volume of data is largely irrelevant unless it speaks directly to the Reptilian Brain. By speaking to the Reptilian Brain, MängaDesign ensures your message breaks through the marketing noise and is effortlessly lodged into your audience’s subconscious. The subconscious brain is where brands live and die, and where the elements essential to marketing success—product interest, purchase intent, and brand loyalty—are formed, and where they reside. MängaDesign’s Neurowise™ methodology helps you improve your sales and marketing communications, by applying neuromarketing’s functional insights. Our NeuroCreative services offer an efficient, cost-effective way to develop scientific marketing tools that reach the brain’s true decision maker—the Reptilian Brain—and strengthen your company’s competitive advantage to boost your bottom line. To make Neurowise™ your winning NeuroCommunication strategy or for any questions, contact Vio Manga at 905.624.8155. It could be your best decision today.